Well, I'm done sewing bibs and droolies and quilts for a while. I sent off a bunch of bibs and droolies to Patience and she's going to sell them at a village wide yard sale in Hampton on Saturday. We'll see how she makes out and then she can evaluate if this is a nice little project for her. I'm updating my sewing list... Before I start back into the quilting, the next few items on my list is Halloween costumes for the triplets. I bought patterns some time ago, but never had the time to collect all the specialty fabric that is needed. If costumes were made out of quilt fabric, I'd be all set. So the first on my costume list is Grace. She wants to be Ariel from the Disney movies. I have been picking up fancy shiny and sheer fabrics here and there, and I have all that I need for Grace's Ariel costume. I'm cutting it out now and I'll probably sew it at the cottage on Sunday. (Depends on the weather). Grace said her mother was going to buy her a Red Wig. I wonder if Michele knows that? Then I'll be making a Dracula costume for Caitlin or a Pirate costume for Mitchell. I have some fabrics for both, but not all. I guess I'll have to make a list of what I'm missing. 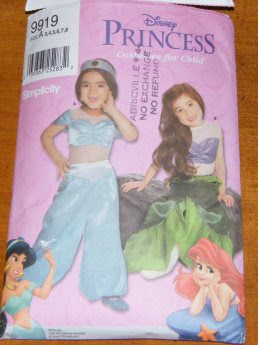 I'll take a picture of Grace when we have her fitting... She'll make a lovely Ariel.